Thoroughly enjoyed using this weeks Passion for Promarkers sketch on the previous card, so I thought I'd go back for another and use one of my favourite "go to" images, which of course, I've coloured with promarkers. Had used Go Kreate dies to mat and layer the image and the sentiment and then framed the image with Memory Box Savannah border die and woodware punched flowers. The butterfly die is from Marianne creatables and the papers were a freebie download from Zoe Pearn. so stunning lisa.really beautiful colours and i love the gorgeous sweet image. Love that color combo - it is so soft and feminine. The vine and flowers frame you created for her is a really nice touch. 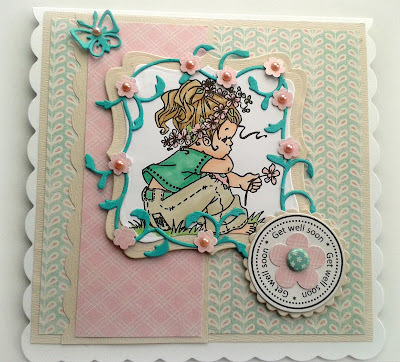 Thanks for sharing your project in the “Anything but a Birthday Card” Challenge at Aud Sentiments. awww, I am so pleased you liked my sketch so much you had another make with it Lisa, I love this one too. I just got this stamp but haven't inked her up yet! Very pretty card! Love the image! She's so sweet! Your die cuts and design are fabulous! Thanks for sharing with us at Crafty Sentiments! What a sweet card. Love the soft colors, all the details, and the adorable image. Thanks for sharing at Aud Sentiments. Lovely get well card. One of my favourite images. Thanks for playing at Aud Sentiments.